The 1990s was a decade of extreme change. Shifts in culture, politics, and technology radically altered the way Americans did business, expressed themselves, and thought about their role in the world. At the center of it all was Bill Clinton, the charismatic and flawed baby boomer president, along with his polarizing but increasingly popular wife, Hillary. Although it was in many ways a Democratic Gilded Age, the 1990s was also a time of great anxiety. The Cold War was over. America was stable and prosperous. Yet Americans felt more unmoored and isolated. This was the era of glitz and grunge, when we relished living in the Republic of Everything even as we feared it might degenerate into the Republic of Nothing. Bill Clinton dominated this era, but his complex legacy has yet to be clearly defined. 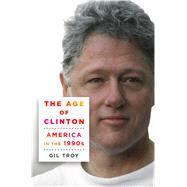 Historian Gil Troy examines Clinton's presidency alongside the decade's cultural changes. Taking the '90s year-by-year, Troy shows how the culture of the day shaped the Clintons even as the Clintons shaped it, offering answers to two enduring questions about Bill Clinton's legacy: How did such a talented politician leave Americans thinking he accomplished so little when he actually accomplished so much? And, to what extent was Clinton responsible for the catastrophes of the following decade, specifically 9/11 and the collapse of the housing market? Even more relevant as we head toward the 2016 election, The Age of Clinton will appeal to readers on both sides of the aisle as it chronicles the wild, transformative decade and the president at its center. Cowboy Cosmopolitanism and the End of History?